Ever since Darwin’s first steps on the Galapagos Islands, understanding the adaptations that offer the giant tortoise its extended lifespan has been a tantalizing scientific pursuit. And now, new research by an international team including researchers from UBC’s Okanagan campus has used the DNA from one famous giant tortoise to uncover the genes that are associated with their longevity. The discovery provides clues to better understand aging in humans and may help preserve the species, says Michael Russello, study co-author and biology professor at UBC Okanagan. To help identify the genes that give the giant tortoise its extended lifespan, the researchers compared the complete DNA sequence from two long-lived giant tortoises. 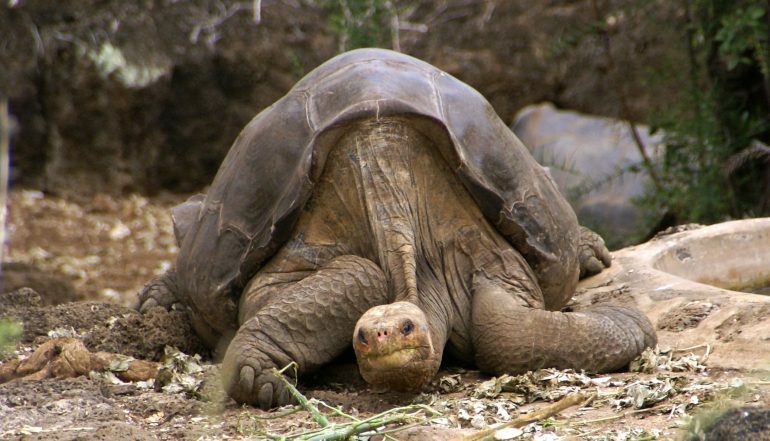 They used samples from Lonesome George--the famed last representative of a species once found on the Galapagos island of Pinta--and from another giant tortoise species found on the Aldabra Atoll, a coral island in the Indian Ocean. By comparing the giant tortoise genomes with those from other species, including humans, they found interesting variation within genes linked to DNA repair, immune response, and cancer suppression not possessed by shorter-lived vertebrates. None of those genomic variants had been previously associated with aging, offering new avenues for further study. While individual tortoises have remarkable longevity, Russello says the Galapagos giant tortoises do not, with all living species considered threatened or endangered. He says the results of their study could provide clues into the biological processes and adaptations that gave rise to giant tortoises in the first place, while helping to better protect these animals on the verge of disappearing altogether. The study was published last week in Nature Ecology & Evolution. UBC’s Okanagan campus is an innovative hub for research and learning in the heart of British Columbia’s stunning Okanagan Valley. Ranked among the top 20 public universities in the world, UBC is home to bold thinking and discoveries that make a difference. Established in 2005, the Okanagan campus combines a globally recognized UBC education with a tight-knit and entrepreneurial community that welcomes students and faculty from around the world. To find out more, visit: ok.ubc.ca.